Walking distance to Salamanca and Constitution Dock. Free parking. Great value for money. Hobart, the capital of the Australian island state of Tasmania, is a city of many charms, among them well-preserved Georgian and Victorian architecture reminiscent of Old Europe, a gorgeous backdrop of the often snow-capped Mount Wellington, beautiful beaches, and a striking natural harbor. holiday rentals in Hobart and surrounds put you within reach of the many smaller towns, natural treasures, and intriguing historical sites on the dramatically rugged Tasman Peninsula. You can explore it all from the base of a private home or apartment that is spacious, peaceful, and packed with the amenities and comforts of home. There's no finer way to experience the treasures of Tasmania. 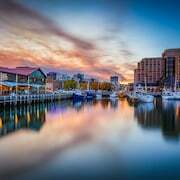 The best attractions of the city are within easy reach of short-term apartment rentals in Hobart and surrounds. 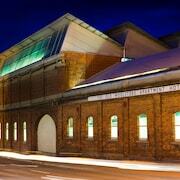 Embrace Hobart's cultural scene with a visit to the Tasmanian Museum and Art Gallery or the Museum of Old and New Art. See the natural side of the city at the Royal Tasmanian Botanical Gardens, known for its plant collections and exceptional variety of native Tasmanian species. You can also drive or hike up kunanyi/Mount Wellington, and watch the view change from the shady forests of the lower slopes to the panoramic expanse of Hobart, the River Derwent, and the distant peninsula. On Saturdays, Salamanca Place hosts a huge market where, among an incredible array of goods, you can pick up the freshest local produce, perfect for a home-cooked dinner back at your place. Browsing and booking holiday rentals in Hobart and surrounds couldn't be easier. Here at Expedia, we provide a vast selection of affordable rental properties, so you can find your perfect home or apartment, and complete your simple and secure booking with the click of a mouse. It's time to make your dreams of a holiday in Australia become reality; book your reservations today.